I bumped into one of my elderly neighbours, Claude, this afternoon. He’s seventy and has advanced cancer but it was lovely to see him and we had a little catch-up. Claude was a PE teacher and a fine figure of a man in his younger years. He’s had a couple of wives and three children, including his much-loved son, Paul, pictured here with Victorine Morena (née Giraud), Claude’s mother. Claude’s been ill for most of the time I’ve known him – over ten years now – and we first met when he was giving an informal mandolin concert in Michèle’s bar while launching his self-published book about his childhood in Pierrefeu. ‘Oh, but I’ve written another book,’ he told me proudly. And proceeded, rather tearfully, to tell me a story about his maternal uncle, Victor Giraud, something of a rogue and the family black sheep. To such an extent that, after he was killed in a gang fight in Paris in 1945, his name was never spoken by his parents, sister (Claude’s mother) or younger brother. And so, in the rambling, somewhat decrepit family house in which he was born, just down the road from mine in the old village, Claude told me his Uncle’s story. Victor Giraud was a bit of a scallywag growing up in Pierrefeu. He was the son of a local shepherd, who kept his goats in the fields just below the village and whose cheeses were sold door-to-door and from the family house in rue de l’Asile. Victor seemed to get into most trouble by ‘borrowing’ various forms of transport to get to the local brothel in Cuers every Saturday evening. These ranged from his father’s mule and cart, the motorbike of a chap who used to visit a local widow every Saturday night and the only car in the village, belonging to the Doctor. In order to ensure his son stayed home, Père Giraud insisted they share a bedroom on Saturday nights. But the bold Victor simply waited until Papa was fast asleep, shimmied down the drainpipe and headed off for a night on the town with his pals. Père Giraud, like most of his generation, fought in the 1914-18 war. He lost two fingers in battle but eventually returned to Pierrefeu, unlike nearly all of his friends. He loathed the Germans and, when the village was occupied, he would swear loudly at them under his breath in Provençal. Claude’s own father was a French POW in Germany from 1939 to 1943. When he came back to Pierrefeu and realised that, at that point, Victor was hiding weapons for the Resistance (stolen from Italians down at the airbase in Cuers) in the family home he hit the roof and Victor and his father made the dangerous journey at night to transport them (in the infamous mule cart again) to a ‘cabanon’ down in the vines. After this, Victor decided to join the Free French army and took the train north, ultimately joining the Normandy landing forces in England and ending up in Paris in 1944. This is where things turned badly for him. He killed a German officer and was imprisoned. There, out of the gloom of his prison cell, he heard a voice asking, ‘Aren’t you Victor, the Pierrefeu shepherd?’. His life in the South came flooding back to him as he greeted a fellow shepherd from Cuers and was transported back to the hills, the vines and the sun of the South of France. However, there was another group of Southerners in prison with Victor, a bunch of gangsters from Toulon and Corsica. Impressed by the murder of the German soldier, they encouraged him to join them and run various bars and brothels in the Place d’Italie in Toulon. Once he was back in Provence, though, the family was ashamed by Victor’s new lifestyle and, when he came home with a wad of notes to give to his father, Père Giraud threw them straight into the fire. Victor died in a gang-fight, settling scores near the Gare de Lyon in Paris, in 1945. He was 23 years old. Claude grew up with his portrait in pride of place in his grandparents’ bedroom, but his name was never spoken and it was only forty years later – in 2005 – that he took it upon himself to research what actually happened and publish the slim volume, ‘Victor, l’Uncle des Maures’. In bringing his Uncle back to life and telling his story, he’s captured a character who resembles so many of the men of Pierrefeu – then and now. Charming, mischevious and deeply loving of their family and their ‘terroir’. RIP, Uncle Victor. This entry was posted in Uncategorized on June 28, 2014 by Julie. At long last, the sun has come out. The sky is azure blue and cloudless and it is beginning to feel as if the damp, chilly winter is behind us. I’m in PF for a few days before heading along to Cannes to work at Mip TV for the week. But on a day like today, it will be very hard to leave the village for the bustling metropolis along the coast, packed as it will be with luvvies and endless meetings in windowless rooms. Not to mention the infamous bunker in ‘Le Palais’. It’s been one of these days when I’ve felt like a real ‘Pierrefeucaine’. I did my shopping in the market, saw people I knew and took advice on which carrots and green beans to buy. Simone was particularly solicitous that I should get my fruit and veggies from the right stall – a local chap (well, ‘un Hyerois’) – and not someone who imports vegetables from other countries. How we laughed at the idea of strawberries from Belgium, which were on display at the non-local stand. Then went down to wonderfully-named ‘Simply’ to get some chicken for my stew and met Corinne from the Tourist Office, who regaled me with her poor experiences at Disneyland Paris (oops) and filled me in on various folk and their medical conditions. There is now a pawnshop next to Dany’s bar. Or rather somewhere that buys gold. Including teeth. Suzie wonders if he has a small room in the back for extractions. The former Petit Casino next to the florists is about to become a medical lab. They’re midway through renovating it and all there is so far is, incongruously, a dentist’s chair (linked to news item one, perhaps?) and a counter. I was hoping for something a little more exciting but the ever health-conscious Pierrefeucains are thrilled at the idea of speedier diagnoses from the village doctor. Talking of supermarkets, the Vival next to Dany’s (which is patently where it all happens in Pierrefeu) has been sold and will re-open as another small supermarche. It’s run by Simone’s grandson. Another one works chez Dany and yet another owns the Blue Dream bar. The Milesi mafia is alive and well. The red boulangerie has new owners . And have done it up so it’s all faux exposed brickwork to simulate a 19th century bakers, I suppose. The bread’s good and I can vouch for their croissants. You still can’t beat the Boulangerie du Mairie for tarts, though. So my casserole got cooked (despite having to borrow garlic from Simone) and going without flour, following the shelf cull after Mr Mouse’s visit last year. I’m about to wash and prepare some (non-Belgian) strawberries and rasps for supper. Then I think I shall retire to the terrasse with my book for the last of the sun, and in anticipation of a wee apero there with the girls later. This entry was posted in Uncategorized and tagged pierrefeu du var village from market square on April 2, 2011 by Julie. Having been denied my Spring long weekend in Pierrefeu because of the pesky ash cloud, I wallowed in some old pictures from last year and found a few to show the work on the facade. So here’s a wee look at the before, during and after on the front of my little ‘maison de village’. This entry was posted in Uncategorized and tagged pierrefeu du var nouveau facade new building works maison on May 15, 2010 by Julie. This entry was posted in Uncategorized and tagged vivre a pierrefeu february 2010 local magazine on February 26, 2010 by Julie. …I was on the beach at St Clair. Same day, mind. Apart from a bit of a breeze, who knew there had been a monsoon first thing that morning? Lunch on the beach, watching children paddling, a snooze in the sun afterwards with a podcast of the Now Show. 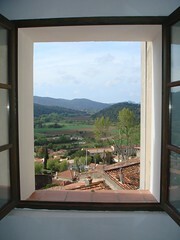 This entry was posted in Uncategorized and tagged st clair le lavandou var provence france on April 21, 2008 by Julie.